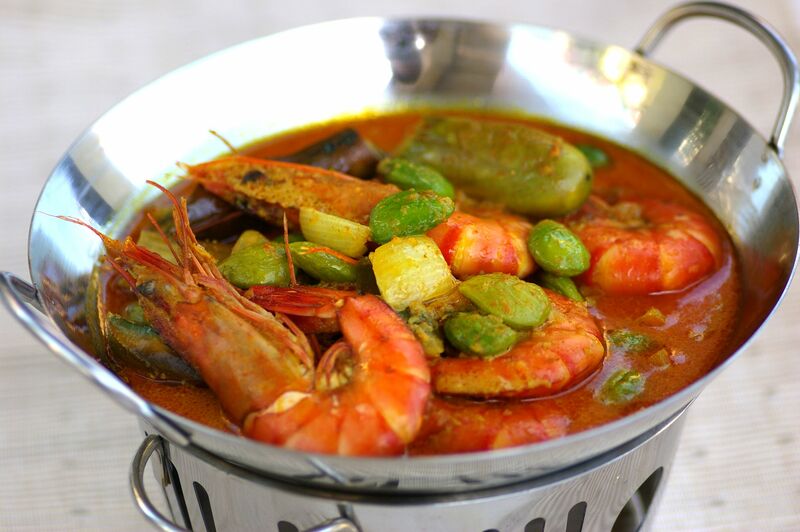 Here is the recipe for stink beans and prawns in curry sauce. Trim the feelers of the prawns. Rinse the prawns and drain well. Peel away the creamy skin of the petai. Heat the oil in a wok and sauté the onion and fenugreek seeds until onion is soft and fragrant. Add ground spices, curry leaves and lemongrass. Fry until aromatic. Add brinjal, water, coconut milk, evaporated milk and kaffir lime leaves. Bring to a boil. Put in prawns and petai, and cook until the prawns change colour. Season to taste.